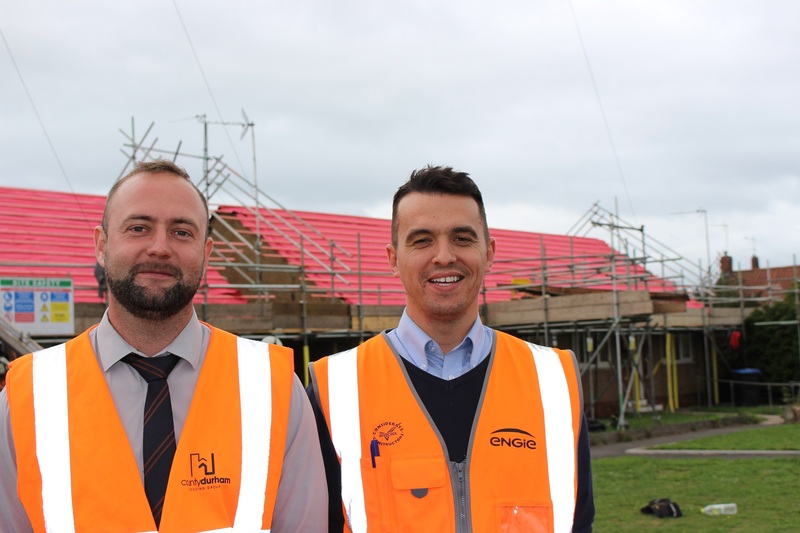 Nearly 70 affordable homes are receiving new roofs, insulation and rendering as part of a huge home improvement investment programme by County Durham Housing Group. Properties in Norwich Gardens, Canterbury Crescent and Wells Grove are among the first in Hall Lane Estate, Willington to benefit from the work. The improvements are being carried out to the latest standards and are expected to help tenants save money on energy costs, as well as providing good quality homes for decades to come. All of the work is expected to be completed during September before starting on other properties in the area. Homes will receive a package of work tailored to their exact needs. Pictured above from left to right is Daryl Reed from County Durham Housing Group and Brian Bedford from Engie in Norwich Gardens, Willington. County Durham Housing Group’s 10-year improvement project will make homes cheaper to run and ensure high-quality affordable housing provision in scores of communities stretching from rural Weardale to the coast. The refurbishments are being carried out in partnership with specialist contractors ENGIE. Work has already been completed on homes in Bearpark, Brandon and Ushaw Moor. Many of the houses have been transformed with new kitchens, bathrooms and wiring, as well as external improvements. ENGIE was awarded the £138m contract by the group following a competitive bidding process based on value for money and quality. The company, formerly known as Keepmoat Regeneration, has a long and successful track record of working in the area and extensive experience of delivering major projects, while minimising disturbance to residents. In addition to the home improvements, environmental work is also being carried out in many areas. County Durham Housing Group Investment Project Supervisor, Daryl Reed, said: “These improvements are really transforming homes and will make a difference to so many families in the area. The work being carried out is pretty substantial, but we’re keeping in close contact with tenants to ensure any disruption is kept to a minimum.